Now, you'll most likely hear about this place from your friendly hotel conceirge after you ask for a recommendation for a nice place to eat. 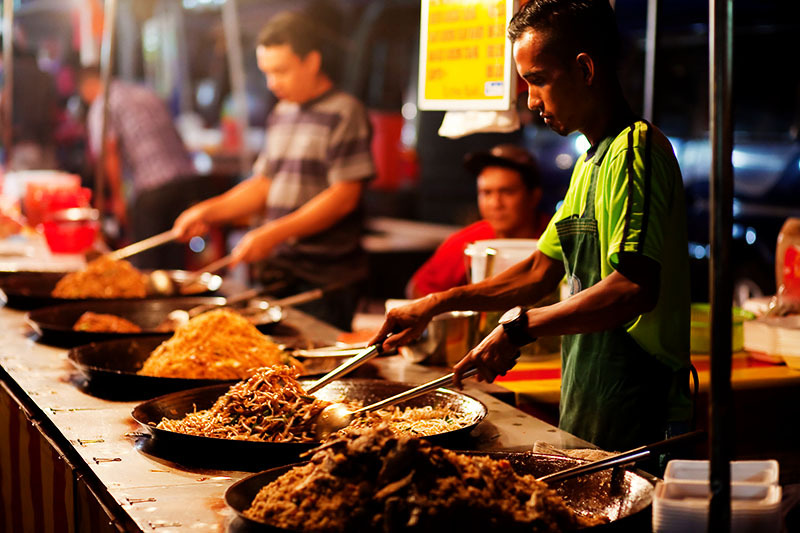 He'll probably tell you about this famous place, near the beach where you can sample some of Penang's best delights. Of course, what he won't tell you is that locals shun this place since the food here is pricey and touristy. And, the locals are right. But still, that doesn't stop the tourists ( especially the families ) from flocking here. Despite the higher than average price, the so-so quality of the food and the suckey parking, people still come here by the droves. If you have to know, hubby and I were here too, without Penang pal's knowledge of course! The only thing that we liked about this place was the BBQ fish ( there is one joint in this place ) and the fantastic green mango rojak with the crisp croutons of yew char kway ( fried dough sticks). Penang Rojak- The stall has an insanely long queue, it's just opposite the only Chinese satay stall that sells intestines satay. Yes intestines. BBQ fish - North west corner, near the mobile vans. There is only one stall that sells this. Dress Code: It's bloody hot and humid over here and you'll be fighting families for a seat so come armed with an umbrella to poke them or packets of tissue paper to wipe your face after a fight.